Wild West Days (1937) is a Universal film serial based on a western novel by W. R. Burnett. It was the 103rd of the studio's 137 serials (and the 35th with sound). Larry and Lucy Munro own a hidden gold mine. Newspaper editor Matt Keeler wants the mine for himself and has Larry framed for to get it. 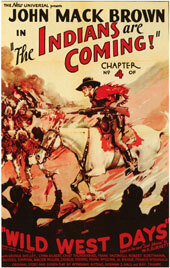 Frontiersman Kentucky Wade - with Dude Hanford, Mike Morales and Trigger Benton - come to the Munros' aid. This serial was based on the novel "Saint Johnson" by William R. Burnett. However, the main character in the serial is a frontiersman called Kentucky Wade instead of Saint Johnson as in the novel. ^ Cline, William C. (1984). "2. In Search of Ammunition". In the Nick of Time. McFarland & Company, Inc. p. 10. ISBN 0-7864-0471-X. ^ Cline, William C. (1984). "Filmography". In the Nick of Time. McFarland & Company, Inc. p. 218. ISBN 0-7864-0471-X. This page was last edited on 18 August 2016, at 12:21 (UTC).